aircraft and will create 18 jobs in the city. Porter has recently made significant investments in Northern Ontario, including opening a base for pilots and flight attendants in Thunder Bay one year ago. The maintenance base will be located in an existing hangar at the airport. Porter engineers will perform daily overnight maintenance on two aircraft that will return to service the following day. Porter currently operates up to seven daily roundtrip flights between the city and Billy Bishop Toronto City Airport. Windsor, New York (Newark), Chicago (Midway), Boston and Washington (Dulles), and has seasonal flights to Mt. 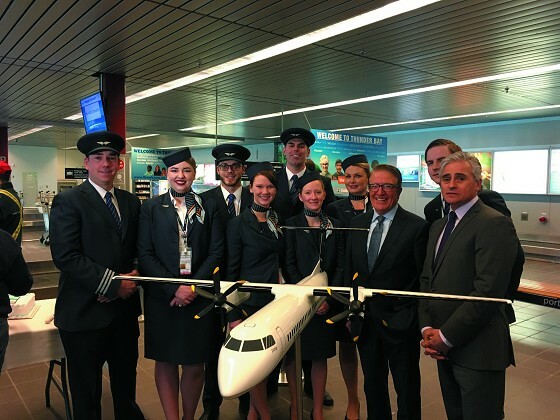 Tremblant, Que., Myrtle Beach, S.C., and Orlando-Melbourne, Fla.
Robert Deluce, President and CEO of Porter Airlines answered some of my questions at the media event. Thunder Bay is an important destination for you? Why do maintenance in Thunder Bay? I noticed significant change at the Toronto terminal building? You and your family has had a long history in aviation.